Canned fruit is an iconic memory of my childhood. I grew up with a mom who canned apples, peaches, pears and sweet cherries (to name just a few). Having home-canned fruit now seems luxurious (or just a lot of work) to many people. But honestly, for a few quarts, it can be done in under an hour! Home-canned fruit is completely different and tastes much fresher than any store bought can. Once you try these peaches, you will forget about ever buying them again. Place water and sugar in kettle on the stove and bring to a simmer. 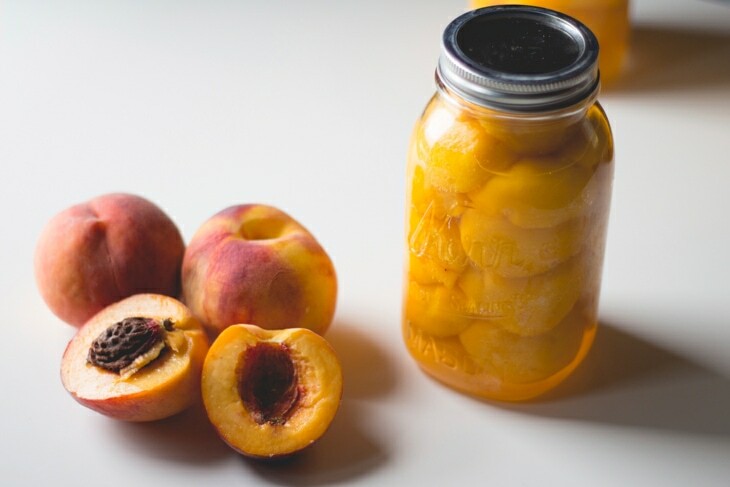 While syrup is heating, place peach halves in sterilized quart jars in a stacked title pattern to help them fit better. Do nut push them in! Once the jars are filled, pour boiling syrup over each. Divide evenly among jars, leaving 1/2 inch of headspace. If the syrup does not fully fill each jar, top each with boiling water, leaving 1/2 inch headspace. Fit with lids and rings, following manufacturer’s instructions, and place in a boiling water bath for 20 minutes. Once completed, place jars on cooling rack or towel and leave with rings on for 24 hours to ensure a good seal. If a jar does not seal, simply place in the refrigerator and enjoy eating! Wide mouth jars are much easier to fit your hand inside. These will last through the winter. And honestly, nothing tastes better in the middle of January than fresh, home-canned peaches!